The Sanctuary of Ta’ Pinu is an architectural masterpiece built in an isolated site in the island of Gozo, in the valley between the villages of Gharb and Ghammar. It is a shrine to Our Lady of Ta’ Pinu, that welcomes all the visitors who wish to pray or simply admire the splendid sculptures and craftsmanship of designs on the Maltese stone inside the church. The Basilica of Ta’ Pinu is one of the most visited places on the island of Gozo – Malta, not only by Maltese people but also by many tourists. Inside you will contemplate great architecture and witness the devotion of the Maltese, expressed on items like helmets, casts, photos, babygrows hanged on the walls as offerings from promises attended by Our Lady of Ta’ Pinu. Opening Time : Monday to Sunday, 6.30am-12.15 and 3.30pm-7pm. 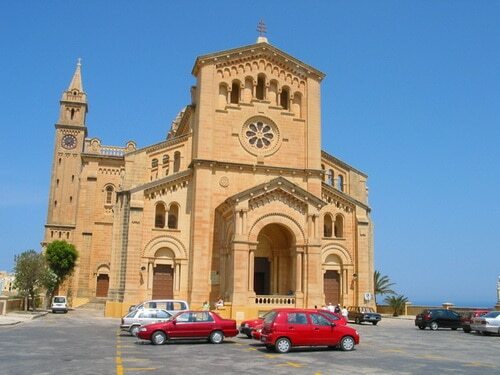 The shrine of Ta’ Pinu is very ancient and its origin is unknown but the first records of the chapel date back to 1534. This place of prayer was built by the noble family of the Gentili (The Gentile) in devotion to Our Lady of the Assumption. In 1575, the church was closed by Msgr. Pietro Duzina, a delegate of Pope Gregory XII, because it was in such a bad state. He also gave orders for the shrine to be demolished but, according to the legend, the first blow with the pick broke the worker’s arm, which was understood as a divine message. So, the chapel was saved. Later on, in 1598, the property where this church lies was bought by another family. This caused the changing of its name to Ta’ Pinu, meaning “of Philip”, after the new procurator Pinu (Philip) Gauci, who offered money so that the church could be restored and liturgical services provided. A new stone altar was then erected and the painting of the Assumption of Our Lady in the altarpiece was made by Amadeo Perugino, in 1619. 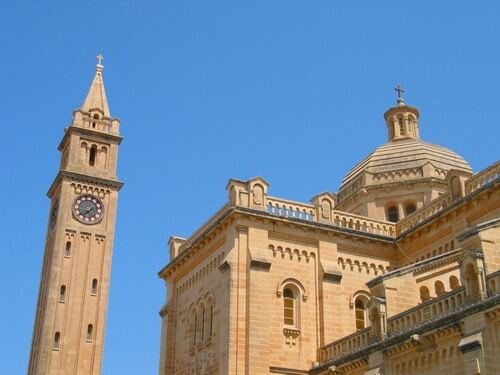 But the most important episode that made Ta’ Pinu the sanctuary it is today happened in 1883. On the 22nd of June, Karmela Grima, a strong believer in the Blessed Virgin, heard someone calling her as she was walking near the chapel. She ran way until she heard it again, this time clearly coming from inside the chapel. When Karmela went in, she was asked, by the voice coming from the image of the Blessed Virgin, to say three Hail Mary’s prayers in honour of the three days her body had stayed in the tomb before Assumption to Heaven. Some time later, Karmela had to stay sick in bed for more than a year but eventually was cured. Only some time after she told one of her friends, Francesco Portelli, the event near Ta’ Pinu. Francesco revealed that the same had happened to him and that, in consequence, his mother had been miraculously healed. These two events were more than enough for people in Gozo and nearby islands to make this site one of pilgrimage to Our Lady of Ta’ Pinu. 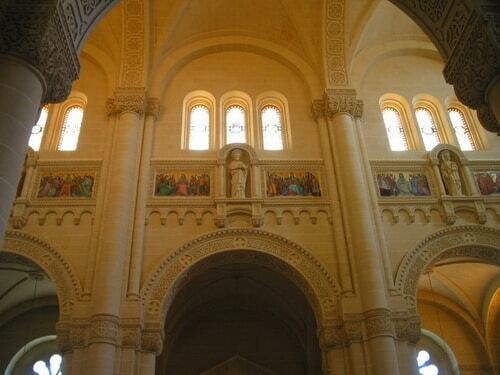 After confirmation from the Holy Church that the stories were true, they decided to build a beautiful Ta´ Pinu Basilica in Romanesque Style, to accommodate the many pilgrims. Construction started in 1920 and by 1932 the new church opened. In 1990, Pope John Paul II went to Ta’ Pinu church, celebrated mass in the forecourt and decorated the image of Our Lady with five golden stars, which represent the devotion of the people in the island of Gozo for the blessed Virgin Mary.